You’ve probably heard the slow, consistant drum beat of the cord cutters. Those who watch video without the use of a cable or satellite provider. They use over the air TV, and online services such as Netflix, Hulu and Amazon Prime. What’s rarely talked about though is what would it cost for a true sports fan to cut the cord? At this stage, there it is not an economically viable solution for a fan of sports to cut their cable or satellite subscription. Let’s look at DirecTV by comparison. The Sports monthly package is $12.99 and with the Choice XTRA Classic plan, 1 HD Receiver with DVR and you’re looking at about $110 a month. 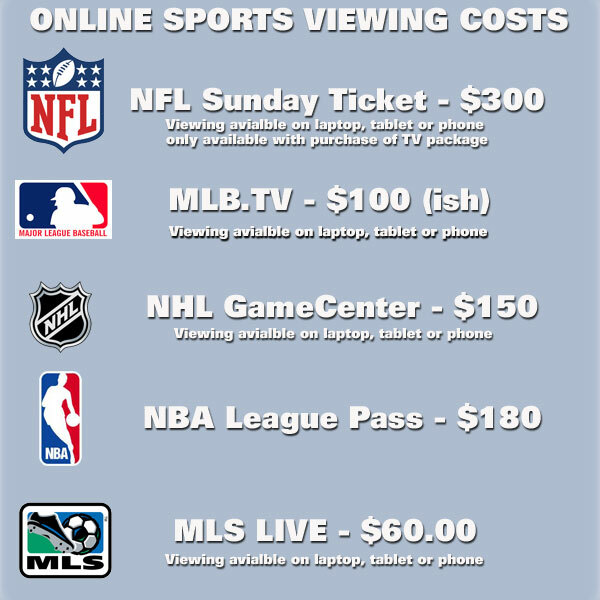 The NFL Sunday Ticket plan and other sports packages (NHL Center ICE, MLD Direct Kick, etc) are all extra. But a lot of times you do not need those. While it isn’t economically viable for a sports fan to cut the cord the cord cutters themselves really do have a distinct advantage, mobility. The fact is that sports fans can only watch whatever is on their TV via a Slingbox. Non sports cord cutters can use any one of the aforementioned services no matter what device they are on (phone, tablet, or laptop). Will there ever be a point where sports fans can cut the cord and do so economically? Probably not. If you take into consideration the continual increase in player salaries and the increase in TV rights fees it is highly doubtful that we’ll see a price decrease from any sports league or online service from a network without a cable or satellite validation.